Jose, my domestic partner, left his grandparents’ loving home and traveled to New York. He was searching for his biological father but he had to stay with his Aunt because his father was in jail for selling drugs. Jose’s aunt lived in a very rough housing project and to blend in Jose followed the crowd and took his father’s place on the block. He sold drugs and was caught a few times carrying an unlawful weapon, but one night to protect himself he shot another man in the leg. This incident would change his life forever. He was arrested and turned eighteen in jail. He was twenty-one when he came out of jail. He swore he would never go back to jail again! He was doing fine and his grandparents moved with him to Connecticut. I met him here in Hartford. It was a very cold December night. I was a single mom struggling. I met Jose and from the very first day he helped me and my daughter. He gained our trust and our heart. With time we moved in together and I was pregnant with his first child and he was happy and scared at the same time. But he knew all along that he wanted to be the father he never had. Jose was doing fine but suddenly after losing a job as a scaffold worker in which he worked for more than 3 years because the company moved to another state, we lost our main household income. His stress and frustration caused many arguments between us. And he kept telling me that he couldn’t find a new job. I thought he was lying but he wanted to prove me wrong by asking me to apply in the same places that he applied for. We went to eight different places mostly restaurants and factories and out of those applications, I was called for three interviews and I was hired in one of the factories. Jose was never called not even for an interview. Yes, he was right but that didn’t help the fact that I was the main provider and Jose felt useless and less of a man because he couldn’t provide for his family. He tried working for temporary agencies that also started to ask for background check and he was never called again to work not even from the agency. I lost him to the streets. He went back to the street and his criminal path destroying our family and himself. The Kennard Ray case hit home. His criminal background was very similar to Jose and like Jose he was trying to turn his life around. Ray’s case brings to surface lots of flaws under Pedro Segarra’s term in office. Ray resigned from a deputy chief of staff position appointed by Mayor Pedro Segarra after the Hartford Courant exposed Ray’s criminal record that included charges of possession of narcotics and unlawful weapon at a very young age (Carlesso and Goode). Immediately after this exposure, the city of Hartford human resource staff conducted the background check that should’ve been done before hiring Ray. Segarra seems to have good intentions by hiring Ray but he never imagined the media spectacle that would follow his decision. Ray’s resignation was a public humiliation in front of the city in which he was well-known because of a position as an organizer for the Connecticut Working Families Party. The Mayor defended himself by claiming that a public servant has to meet “higher standards” and he’s right a person that’s hired for a leadership position in the city of Hartford should uphold to these higher standards and be an example of what a law-abiding citizen can do for their community. But if he thought that Ray was that guy, he should’ve looked into Ray’s file before appointing him and announcing his position to the public. In the midst of this commotion Segarra should’ve stood by his decision and not accepted Ray’s resignation and maybe Ray could’ve been a great example of what an ex-convict can accomplish if given the right opportunity. Mayor Segarra was a big supporter for the ordinance of “banning the box,” a proposed idea of eliminating the box that asked applicants for their criminal background from the city of Hartford application forms. This ordinance would gives ex-convicts an equal chance in the hiring process so they can prove they were qualified for the job, but the ban the box defeats its purpose if when the background check is done the future employer still discriminates against the possible employee because he has a criminal record. Segarra should’ve led by example and not discriminate against Ray and his actions contradict the whole purpose of “banning the box.” The Mayor should’ve given Ray a second opportunity. Ray had experience and solid references by his former employers and he was qualified to do the job but being an ex-convict disqualified him from this position because of the higher standards required for this leadership role. The “Ban the Box” ordinance needs to be evaluated and renewed depending on the severity of the case, the length of time since the crime was committed and the individual’s job exposure. For example, a child molester should never work around children or a bank robber should not be exposed to large amounts of cash that can trigger his criminal behavior. The Ban the Box ordinance had good intentions, but it is ineffective and it doesn’t help ex-convicts rehabilitate, does not give them the same opportunity as any other individual applying for a job, because at the end their past will automatically determine their future. To be fair, background checks should be used to protect the public not to dismiss a nonviolent offender from the opportunity of getting the job . The Ban the Box ordinance should be a more extensive process that looks at individuals separately depending on their cases and offer them some kind of probation period to evaluate their job performance, just like every other citizen. Or maybe just like society forgives a person’s poor credit history after a certain amount of years, we should come up with some kind of criminal bankruptcy in this case a pardon for criminal behaviors, after a certain period of time. Sadly, Ray’s youth behaviors like Jose’s will follow him to his grave. However his troubled youth past could’ve been used as an advantage. As a liaison for the community many ex-convicts could’ve related to Ray. He could’ve been an asset for this position because ex-convicts and troubled youth could’ve found hope for a better future though Ray’s example. Ray is only one case compared to 75% of The State of Connecticut prison population which is Hispanic and African American (Simpson) and just like Ray and Jose they can’t have an opportunity to make a living in a decent way because they are “branded” in our society. 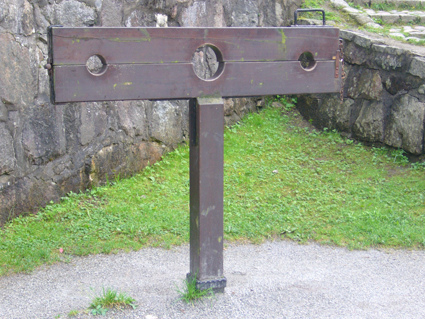 The Hartford Courant and media exposure followed by the mayor’s decision’s of accepting Ray’s resignation made society look like ex-convicts are sent to the pillory, “a device made of a wooden or metal framework erected on a post, with holes for securing the head and the hands formerly used for punishment by public humiliation and often further physical abuse like shaving their hair, flagellation (the pillory serving as the “whipping post”) or even permanent mutilation such as branding, The pillory is related to the stocks”(Wikipedia ). It was used by our founding fathers and on the Old State House grounds to this day conserves a pillory from centuries ago. I can just imagine Ray’s family and the media around the pillory just like they did centuries ago. It shows that society hasn’t changed much at all. Do we have the right to condemn Ray and ex-convicts for using their hands to provide for their family a better future as any other citizen? Why are we so harsh and judgmental against ex-convicts? Just like we did centuries ago, today’s society sends ex-convicts to the pillory! It only proves that we can hide a box as much as we want from an application form, but we will never hide the fact that we are a prejudiced society that doesn’t believe in second chances and the rehabilitation of a prisoner who served his time and paid his debt to society. The same society that sentences ex-convicts to a life sentence of being a record number “branded” with “F” for felon. Why can’t we see them as human beings capable of learning from their mistakes? I’m not asking society to let loose in public places all rapists, murderers and child molesters because these are very severe cases. I’m asking to give non-violent offenders that committed crimes at a very young age a second chance in life for them and their family’s future. Submitted for ENG 101 Composition, Fall 2014. Assignment: Evaluation. Instructor comment: Carmen demonstrates a very powerful beginning technique: the anecdote. She takes an academic analysis and makes it personal and easy to relate to. I also loved the inclusion of the pillory and her use of the historic reference as a modern symbol for today’s treatment of previously convicted people. Photo Credit: “Pillory-Halden” by tölvakonu. Licensed through Creative Commons.